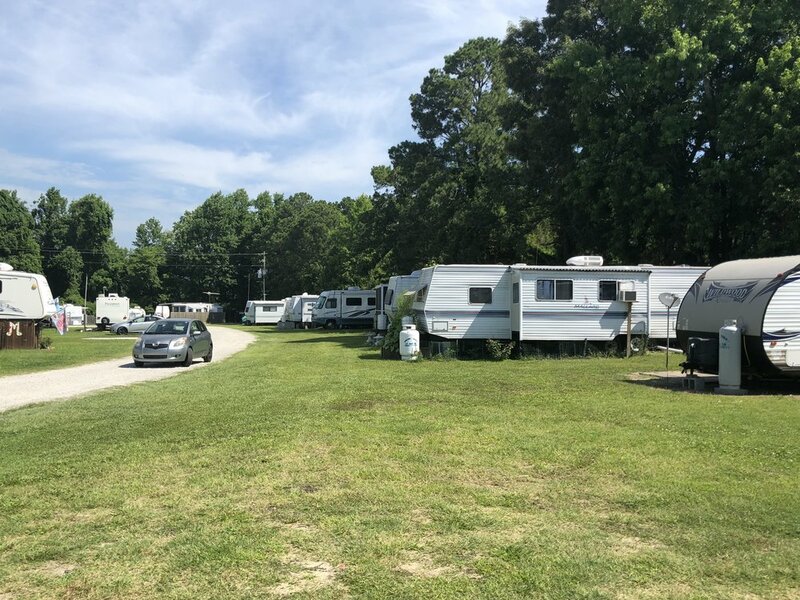 Sneads Ferry is a small fishing village on The New River and Intracoastal Waterway (ICW) and is conveniently located next to Camp Lejeune's Courthouse bay gate, Stone Bay gate and North Topsail Beaches. Woodcreek is a small, quiet park with lots large enough to park your boat, camper and vehicle. We are an extended stay RV park only. We currently only offer 12 month leases. Woodcreek is perfect for people who are looking for an affordable weekend home close to the water. We do not accept tenants who plan to use the park as their primary residence with the exception of active duty military. Wifi, water, sewer, trash, and lawn service are all included with rent. Pets are welcome. All dogs must be approved.by the office. Each tenant is allowed a maximum of two dogs. Lots are 25-30ft wide and deep enough to fit an RV, Boat and vehicle. Each lot is wired for electricity with both 30 and 50 amp. hookups. We only offer 12 month leases. Tenants can only use the park as a secondary residence. The monthly rate is listed below. Rent includes water, sewer and trash. Tenants pay for the amount of gas and electricity they use. We require a $600 security deposit and first month's rent to move in. Shorter term tenants are approved on a case by case basis upon inquiry. Wifi, water, sewer, trash and lawn service are included. Our office hours are Monday- Friday from 9am to 12pm. You can also call to make an appointment. Thank you for contacting us! We will try to be in contact with you within 24hrs.